In the early days of space flight ages ago it served no other purpose than being the means of travel between two planets. But in the last decades space travel has become much more. Thousands of people now live most of their lives solely in space, calling some space station their home instead of a planet, or a country. Space stations have increased in size, having grown into full-fledged habitats with food production units and factories able to satisfy every need of the populace. Naturally, these cities in space require huge amount of materials and minerals to sustain and support themselves. If they’re lucky enough to orbit a populated planet they are seldom in want of anything, but others must fend for themselves. Planetary mining of uninhabited planets and moons is vitally important for any manufacturing station that wants to compete on equal footing. Although such stations do exist without the support of a mineral rich stellar body below it, such station must rely on minerals being transported to them, which is always more cumbersome and expensive. This has made uninhabited but mineral rich planets gold mines often in the literal sense for anyone aspiring to large-scale manufacturing. One such mineral-rich planet is Konrakas in the system of Shintaht. 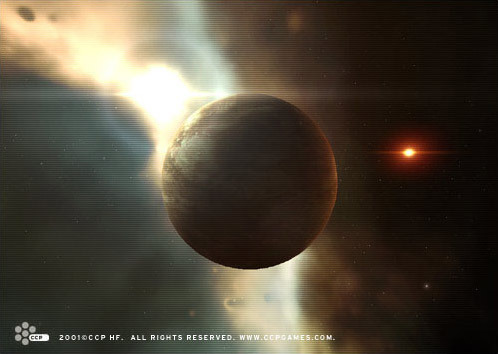 The system, originally surveyed and named by the Caldari, lies close to Amarr space and has been claimed by both the Caldari and the Amarriasn, although neither has yet settled the system. Konrakas has an extremely chaotic climate. The seasons vary greatly, ranging from icy cold to scorching heat. Ocean tides are dramatic and floods are very common. Winds howl constantly over the landscape, frequently reaching hurricane speed. The gravitational forces also cause earthquakes regularly, as well as volcanic eruptions. The planet is, not surprisingly, completely lifeless. The natural forces shaking the planet have also caused many rare and valuable minerals to shift close to the surface, making the planet a mineral heaven. These same natural forces, however, make it extremely difficult to mine these minerals, and neither the Caldari nor the Amarrians have yet found the willingness to make the heavy investment needed to start a planetary mining operation on Konrakas.